FAA Orders Inspections Of Engine Type That Blew Apart On Southwest Flight : The Two-Way The Federal Aviation Administration says CFM engines, which power many Boeing 737s, need to be ultrasonically inspected after a certain number of takeoffs and landings. National Transportation Safety Board investigators examine damage to the engine of the Southwest Airlines plane that made an emergency landing at Philadelphia International Airport in Philadelphia on Tuesday. The Federal Aviation Administration has ordered inspections of fan blades on some jet engines of the same type as the one that blew apart on a Southwest Airlines flight, causing the death of a passenger and injuring seven others. Meanwhile, Philadelphia's medical examiner says Jennifer Riordan, who died on the Dallas-bound Boeing 737 flight, was killed by blunt trauma to her head, neck and torso when she was partially blown out a cabin window shattered by engine debris. Federal inspectors say Riordan, 43, was wearing a seatbelt at the time of the accident. Investigators say a fan blade in the engine separated, showering the plane with debris. The plane, which took off from New York, was forced to make an emergency landing in Philadelphia on just one engine. The FAA said late Wednesday that some 220 CFM56-7B engines, used to power Boeing 737s, must be ultrasonically inspected after a certain number of takeoffs and landings, according to The Associated Press. Separately, Southwest Airlines announced a similar inspection of its fleet over the next month, according to The New York Times. The Times says American Airlines has about 300 planes with the same type of engines and Delta Air Lines has about 185. The engines are produced by CFM, a 50/50 joint company of GE and Safran Aircraft Engines. In a statement on Wednesday, CFM said the inspections were being conducted "out of an abundance of caution." The company claims that the CFM56 series is "The world's best-selling jet engine." The AP notes, "It is unknown whether the FAA's original directive would have forced Southwest to quickly inspect the engine that blew up. CEO Gary Kelly said it had logged only 10,000 cycles since being overhauled." National Transportation Safety Board Chairman Robert Sumwalt says the fatigue fracture that likely caused the engine on the Southwest plane to break apart would have been difficult to detect. "It was on the interior part of the fan blade," he said, adding that it was "certainly not detectible from looking at it from the outside." 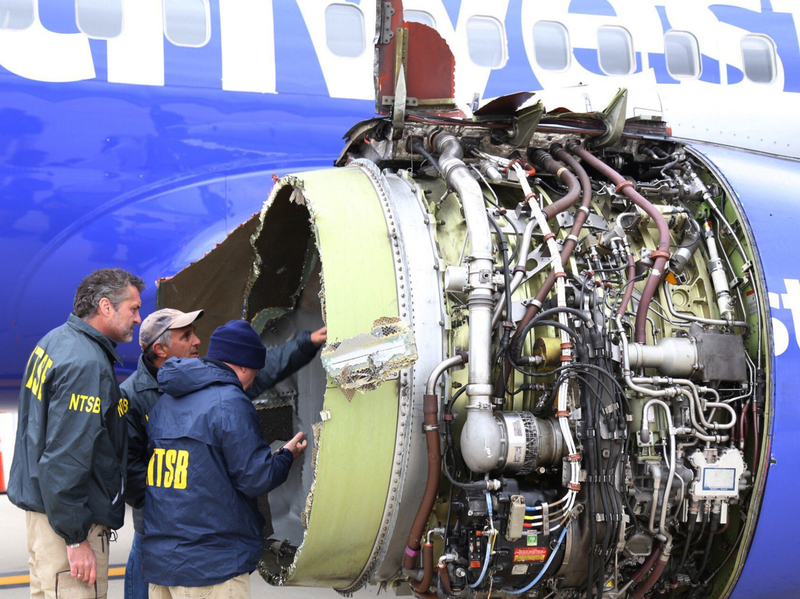 As NPR's David Schaper reports, NTSB investigators found a similar metal fatigue problem was the likely cause of engine failure on another Southwest Airlines flight in August of 2016. Sumwalt said he was not yet ready to draw any broader conclusions about the engines.